displayed when right clicking the player directly. The three buttons Create, Invite, and Leave at the top of the window correspond to parties. 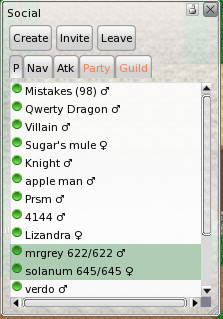 The default tab, labelled “P”, of the social window will display nearby players and the damage they take in combat. 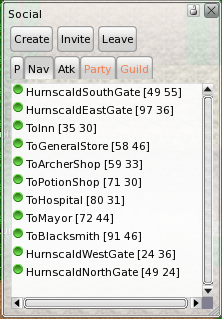 This tab will also display the health of party members as sent by the server. map coordinates. Clicking any of the points will navigate your character there. 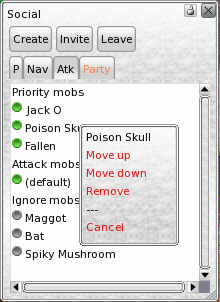 The attack tab, labelled “atk”, displays priorities for attacking and targeting mobs. You can change the priority of a mob by right clicking it and selecting “add to priority attack list, add to attack list, or add to ignore list”. Adding a mob to the priority list will make targeting or attacking select this mob first. You can move a mob higher on the list to increase it’s priority over other monsters that have priority. Adding it to the ignore list will make the targeting and attacking ignore the mob entirely.